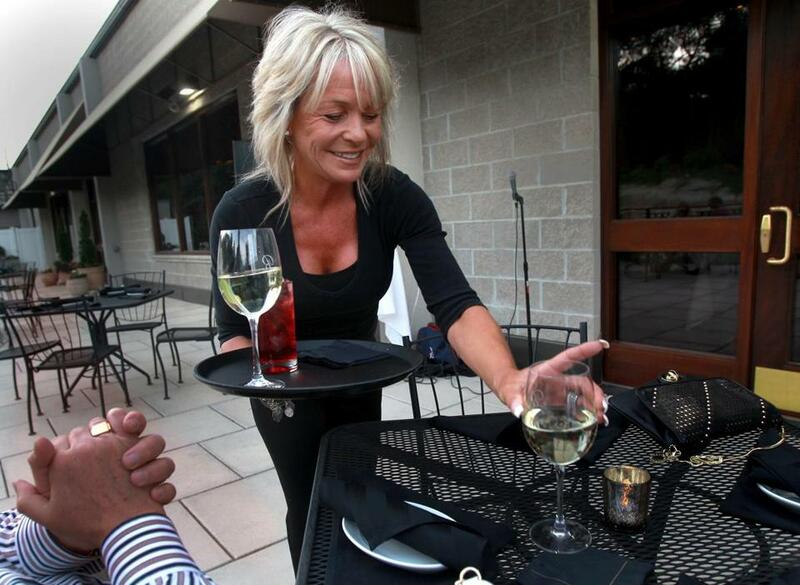 Janice Santarpio served pre-dinner wine to a table outside Rosaria&apos;s Steakhouse in Saugus last summer. No liquor license? No problem. Two city councilors want to introduce a new concept to Boston restaurants: BYOB, or “bring your own bottle” of wine or beer. The phenomenon has flourished in Philadelphia and Chicago and was recently adopted in Brookline. Proponents say BYOB makes it easier for budding chefs to open neighborhood spots. In Boston, liquor licenses are scarce commodities, often prohibitively expensive for small restaurants. But the BYOB idea could spark a backlash from established restaurateurs who made significant investments to buy liquor licenses, which cost up to $75,000 for wine and beer and $375,000 for a full bar. Murphy and Wu said their proposal targets BYOB for neighborhoods that don’t have a vibrant dining scene, not existing destinations such as Newbury Street or the Seaport. That approach has worked elsewhere, said Eli Feldman, owner of Three Princes Consulting and Clothbound technology, both of which focus on the hospitality industry. “Other cities have shown that smaller restaurants can open in newer, less-established neighborhoods where BYOB is allowed,” Feldman said. The best example may be Philadelphia, where BYOB has become such a part of the culture that diners arrive at fine restaurants with chilled sauvignon blanc in insulated wine totes. The website Visit Philadelphia devotes an entire section to highlight dozens of BYOB restaurants, which range from the laid-back taqueria Honest Tom’s Taco Shop to Melograno, an upscale Italian trattoria. Boston could embrace BYOB restaurants without approval from the Legislature, a rare quirk in a state where even inconsequential Boston initiatives require the blessing of Beacon Hill. City Council approval is needed — after the public has its say at a hearing. The measure would also require the signature of Mayor Martin J. Walsh, who expressed skepticism but said he was “open to the idea.” In an interview Friday, Walsh said he had not spoken to councilors and needed to do more research. The proposal would end the city’s longtime prohibition against customers bringing alcohol into restaurants that do not have liquor licenses. It would then direct the Boston Licensing Board, which is controlled by the mayor, to create rules to regulate BYOB establishments. The Licensing Board would determine the type of alcohol — wine, beer, or spirits — that could be brought in by customers. The board would also dictate other requirements, such as whether establishments could charge customers “corkage fees” for drinking their own beverages. The state has a strict cap on the number of Boston liquor licenses, which accounts for the sky-high prices, said Perkins, who founded Boston Restaurant Group. Murphy said he expected push back, especially from restaurant owners who fear the change could jeopardize the value of their liquor licenses. BYOB has been successful elsewhere in Massachusetts and is allowed in Needham, Rockland, and Westborough, said Steve Clark of the Massachusetts Restaurant Association. One rising restaurateur with an interest in BYOB is Patrick Lynch. In 2011, Lynch and his wife offered their own twist on Vietnamese cuisine with Bon Me, which was one of Boston’s first food trucks. Bon Me has grown from a staff of seven to a company with 100 employees, five food trucks, and two restaurants, including a new location near the Boston Children’s Museum in Fort Point. BYOB could help entrepreneurial chefs. Feldman, said Boston is big enough to accommodate traditional liquor licenses and BYOB.